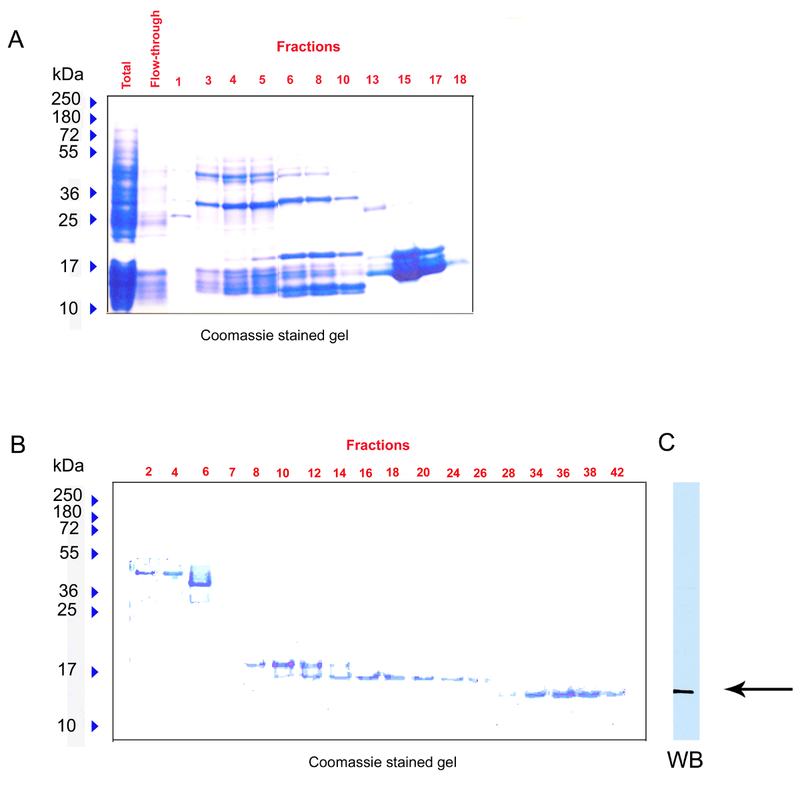 A two-step chromatographic method is described for the purification of recombinant Shadoo protein expressed as inclusion bodies in Escherichia coli, as well as a protocol to fibrillate purified Shadoo into amyloid structures. Li, Q., Richard, C. A., Moudjou, M., Vidic, J. Purification and Refolding to Amyloid Fibrils of (His)6-tagged Recombinant Shadoo Protein Expressed as Inclusion Bodies in E. coli. J. Vis. Exp. (106), e53432, doi:10.3791/53432 (2015). The Escherichia coli expression system is a powerful tool for the production of recombinant eukaryotic proteins. We use it to produce Shadoo, a protein belonging to the prion family. 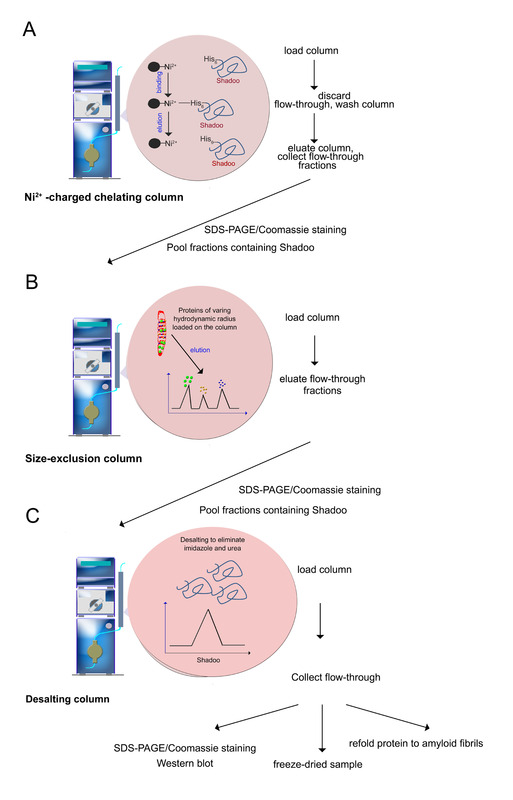 A chromatographic method for the purification of (His)6-tagged recombinant Shadoo expressed as inclusion bodies is described. The inclusion bodies are solubilized in 8 M urea and bound to a Ni2+-charged column to perform ion affinity chromatography. Bound proteins are eluted by a gradient of imidazole. Fractions containing Shadoo protein are subjected to size exclusion chromatography to obtain a highly purified protein. In the final step purified Shadoo is desalted to remove salts, urea and imidazole. Recombinant Shadoo protein is an important reagent for biophysical and biochemical studies of protein conformation disorders occurring in prion diseases. Many reports demonstrated that prion neurodegenerative diseases originate from the deposition of stable, ordered amyloid fibrils. Sample protocols describing how to fibrillate Shadoo into amyloid fibrils at acidic and neutral/basic pHs are presented. The methods on how to produce and fibrillate Shadoo can facilitate research in laboratories working on prion diseases, since it allows for production of large amounts of protein in a rapid and low cost manner. Prion neurodegenerative diseases, which include bovine spongiform encephalopathy in cattle, scrapie in sheep and Creutzfeldt-Jakob disease in humans, are fatal and incurable. Prion diseases are characterized by conformational changes of cellular prion protein mainly composed of α-helices, into the cross-β-sheet enriched amyloid conformer 1,2. Cross-β-structures contain densely packed and highly ordered crystalline-like β-sheets stabilized with hydrogen bonds 3,4. Prion amyloids can self-replicate due to the β-strands at the growing edge that provide a template for recruiting and converting a monomeric protein unit. According to the "protein only" hypothesis, the amyloid conformer of prion protein is the sole infectious agent. However, some other biomolecules have been proposed to be essential to prion disorders. For instance, cell membranes are thought to be a place where conversion takes place and some negatively charged lipids have been shown to enhance the conversion process 5,6. In addition, some proteins may also be involved in prion pathologies. Specifically, there are two other members of the prion protein family: Doppel and Shadoo 7,8. Doppel has a relatively rigid structure stabilized with di-sulfide bridges and fails to self-polymerize and aggregate to amyloid fibrils 9. In contrast, similar to prion protein, Shadoo can adopt a β-sheet-enriched structure and self-associate into amyloid fibril structures. It was shown that Shadoo can fibrillate under native conditions or upon binding negatively charged membranes 10,11. Conversion of Shadoo into amyloid-like fibers may be associated with pathologies. Indeed, the mechanisms by which amyloid-like structures cause disease are poorly understood. Shadoo bears a hydrophobic domain (HD) and a series of tandem Arg/Gly repeats similar to the N-terminal part of prion protein (Figure 1A). As the N-terminal part of prion protein, Shadoo is highly positively charged and appears to be a natively unstructured protein 11,12. Shadoo seems to be functionally related to prion disorders since it can directly bind prion protein. In addition, its expression is down regulated during prion pathology 13,14. However, the role of Shadoo in prion disease is not yet established. We developed a plasmid carrying the coding sequence of the mouse Shadoo gene. The plasmid was used to transform E. coli for production of N-terminal His6 fusion Shadoo protein. This expression system is well established in our laboratory and is commonly used in our ongoing projects 6,15,16. An important issue for expression of Shadoo is the choice of the E. coli strain. While competent BL21 bacterial strain is commonly used for expression of recombinant proteins Shadoo was successfully expressed and purified only from the transformed SoluBL21 bacterial strain. SoluBL21 competent E. coli is an improved mutant of BL21 host strain developed for the production of proteins whose expression in the parent BL21 gave no detectable soluble product. High-level expression of Shadoo in SoluBL21 E. coli leads to accumulation of the protein in inclusion bodies. As a general feature, when a non-native protein is highly expressed in E. coli, this protein tends to accumulate in insoluble inclusion bodies. Shadoo probably aggregates through non-covalent hydrophobic or ionic interactions (or a combination of both) to highly enriched dynamic structures formed by the protein folded to various degrees. In consequence, the purification comprises at least two steps: (i) a selective separation of the protein from other biomolecules in a denaturation medium, and (ii) a renaturation of the purified protein using in vitro folding techniques. The selective separation of Shadoo was achieved in a buffer solution containing 8M urea (or alternatively 6M Guanidine-HCl). The urea removal and the renaturation of the protein can be done by applying various protocols: (i) renaturation in an acidic pH solution to obtain an unstructured monomeric Shadoo protein, or (ii) renaturation in a solution of pH ≥ 7 to obtain Shadoo polymerized into stable amyloid fibers with characteristic cross-β-sheet motifs. Note: The gene encoding murine Shadoo protein (Shadoo25-122), was subcloned into the expression vector pET-28 11. This clone was transformed into E. coli SoluBL21 bacterial strain, to express Shadoo protein with a N-terminal hexahistidine tag, (HHHHHHHHHHSSGHIDDDDKHMKGGRGGARGSARGVRGGARGASRVRVRP APRYGSSLRVAAAGAAAGAAAGVAAGLATGSGWRRTSGPGELGLEDDENGAMGGNGTDRGVYSYWAWTSG) as explained previously 11. The plasmid can be requested from the authors. The molecular weight of Shadoo calculated from its amino acid sequence is 12,243.2 Da. Note: Perform all manipulations with bacteria under a laminal flow hood or close to Bunsen flame. Transform competent SoluBL21 bacteria with the pET-28-His6-Shadoo plasmid, using a standard heat shock protocol. For this mix 1 to 5 µl of the plasmid (typically 10 pg to 100 ng) into 50 µl of the bacteria in a tube. Perform the heat shock at 42 °C for 45 sec. Culture transformed bacteria at 37 °C until A600 of 0.5-0.7 in Luria-Bertani medium supplemented with 40 mg/ml kanamycin (Figure 1B). Induce Shadoo expression O/N by adding 240 µg/ml isopropyl-β-D-thiogalactopyranoside, ITPG, to the culture. Culture bacteria under shaking at 150 rpm at 37 °C. Note: Typically, bacterial culture reaches A600 of 3 O/N. Note: Transformed bacteria can be stored at -80 °C for future protein production. For this, add 10%-50% (v/v) sterile glycerol into bacterial culture aliquots and freeze them at -80 °C. Figure 1. Scheme of Shadoo expression construct, bacteria transformation and induction of Shadoo expression (as described in step 1). (A) The expression construct for Shadoo encodes a hexahistidine tag fused to the N-terminus of the protein, Nt. The scheme shows that Shadoo protein contains basic arginine/glycine repeats (green cylinder), a hydrophobic domain (HD), and a single N-glycosylation site (CHO), followed by a C-terminus (Ct). 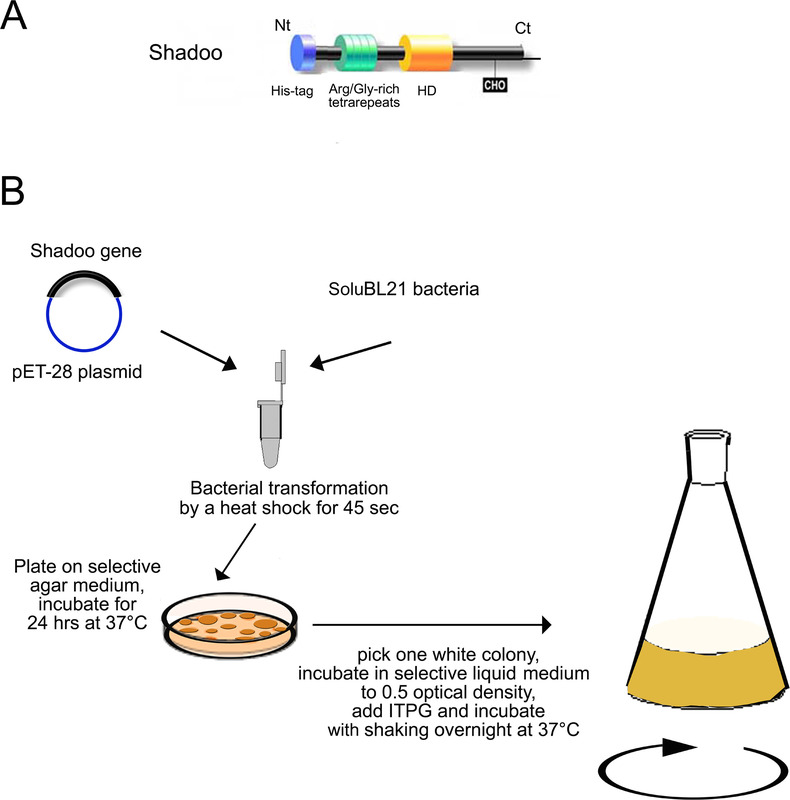 (B) pET-28-His6-Shadoo plasmid is transformed into SoluBL21 bacteria by heat shock for 45 sec at 42 °C. Transformed bacteria are plated on selective agar containing 40 µg/ml kanamycin. A single colony from the plate is used to inoculate a culture in a 1,000-3,000 ml shaker flask. Expression of the recombinant protein is induced with 1 mM IPTG. Please click here to view a larger version of this figure. Collect the bacterial suspension and transfer it into centrifugation tubes (Figure 2). Spin at 2,500 x g, for 20 min at 4 °C. 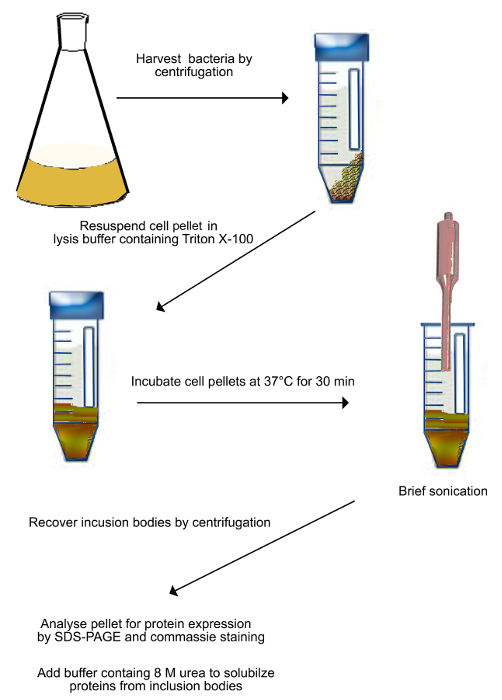 Remove supernatant by decanting and resuspend pellets in 15 ml buffer (50 mM Tris, 10 mM EDTA, pH 8 with anti-protease cocktail) for each pellet derived from 500 ml of cell culture. Note: Resuspended pellets can be frozen and stored at -20 °C for several days. Freezing facilitates bacterial cells lysis. Check the over-expression of recombinant protein using crude bacteria pellets by SDS-PAGE analysis and Coomassie staining. For this, centrifuge 1 ml of bacterial culture to pellet cells. Add 100 µl Laemmli denaturation solution (277.8 mM Tris-HCl, pH 6.8, 4.4% SDS, 44.4% w/v glycerol, 0.02% bromophenol blue) to pellet and heat at 100 °C for 5 min. Load 10 µl of the sample to a 12% acrylamide gel, run SDS-PAGE and visualize separated proteins by Coomassie staining. Add Triton X-100 to 0.5% final concentration to the completely resuspended pellet from 2.1.2). Incubate the suspension in water bath at 37 °C for 30 min. Sonicate the suspension for 5 min at 6-12 microns peak-to-peak amplitude in ice-cold water to lyse bacterial cells. Transfer sonicated suspension into clean 50 ml centrifugation tubes. Centrifuge tubes at 15,000 x g for 15 min at 4 °C. Remove supernatant by decanting and add 5 ml of the binding buffer (20 mM Tris-HCl buffer, pH 7.4, 0.5 M NaCl, 8 M Urea, 5 mM Imidazole) per tube. Place tubes on the rotating wheel O/N to completely resuspend proteins from inclusion bodies. Figure 2. Scheme of purification of inclusion bodies (as described in step 2.1). Transformed bacteria expressing Shadoo are harvested by centrifugation and resuspended in the lysis buffer. The suspension is incubated at 37 °C for 30 min, and then sonicated to mechanically break bacterial cells. Sonication is done on ice to prevent sample heating. Broken cells are harvested by centrifugation and resuspended in a buffer containing 8 M urea to solubilize proteins from inclusion bodies. Please click here to view a larger version of this figure. Note: Chromatography is performed on FPLC System using a Ni2+-charged, 5 ml Sepharose chelating column (Figure 3A). All solutions are loaded on the column with a flow rate of 1 ml/min. Inject 10 ml of 0.2 M NiSO4 water solution into the Sepharose column in order to charge it with Ni2+-ions. Equilibrate the column charged with Ni2+-ions by injecting 30-50 ml of the binding buffer containing a low concentration of imidazole (20 mM Tris-HCl buffer, pH 7.4, 0.5 M NaCl, 8 M Urea, 5 mM Imidazole). Load the urea-solubilized proteins with a 50 ml injection loop. Recover the flow-through fraction by thoroughly washing the column with 10 ml low imidazole binding buffer (20 mM Tris-HCl buffer, pH 7.4, 0.5 M NaCl, 8 M Urea, 5 mM Imidazole) in order to remove a maximum of unbound proteins from the column. Wash the column with 50-100 ml of the washing buffer (20 mM Tris-HCl, pH 7.4, 0.5 M NaCl, 8 M urea, 80 mM imidazole) to elute proteins non-specifically bound to the column. Apply a 15 min linear gradient of 80-800 mM Imidazole in the buffer containing 20 mM Tris-HCl, pH 7.4, 0.5 M NaCl, 8 M Urea. Collect 1 ml fractions during the gradient application. Note: His-tagged-proteins are eluted with a gradient of imidazole-containing buffer (used as a competitor). Take a 8 µl aliquot of each fraction and add 4 µl 4x Laemmli denaturation solution (see 2.1.3.1). Heat solutions at 100 °C for 5 min. Load 10 µl of protein size marker and 10 µl of each sample to the 12% acrylamide gel, run SDS-PAGE and visualize separated proteins by Coomassie staining. Note: The molecular weight of Shadoo calculated form its amino acids sequence is 12,243.2 Da. Pool all fractions containing Shadoo. Figure 3. Purification procedure (as described in steps 2.2-2.4). (A) Ni2+-ions can be coordinated by histidine residues, which allows the selective purification of polyhistidine-tagged proteins. Imidazole is used to elute the protein, through its ability to coordinate with the Ni2+-ion and displace the bound protein. (B) Proteins of varying hydrodynamic radius that were retained on the Ni2+-column are separated onto a size exclusion column. Proteins are eluted from the largest to the smallest ones. (C) Prior to use, fractions containing Shadoo are pooled and desalted to remove urea, imidazole and salts. Quality control assays include SDS-PAGE/Coomassie staining, Western blotting. Purified Shadoo can be freeze-dried. Lyophilized Shadoo is stable for months when stored at -20 °C. Please click here to view a larger version of this figure. Note: A second purification step consists in the size exclusion chromatography which separates Shadoo protein from the other proteins co-eluted during the first purification step (Figure 3B). Equilibrate Superdex column of 120 ml total bed volume by injecting 250 ml of 20 mM Tris-HCl buffer, pH 7.4, 0.5 M NaCl, 8 M Urea at the flow rate of 1.5 ml/min. Load pooled fractions containing Shadoo from 2.2.9 on the equilibrated column. Collect 1 ml fractions after the column-void volume of 40 ml upon the constant flow of the above buffer. 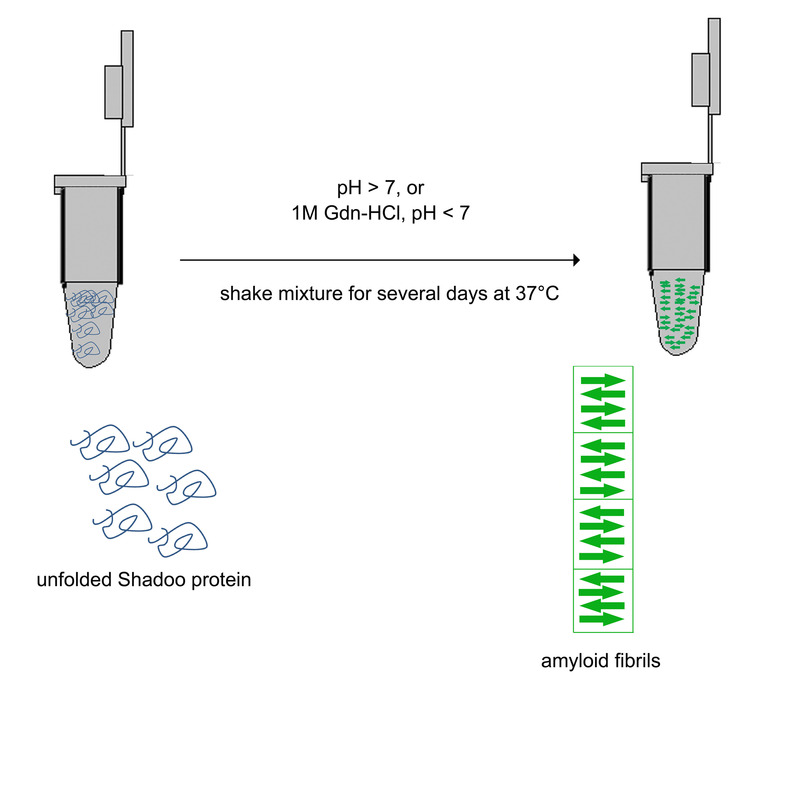 Take a 10 µl aliquot of each fraction and perform a SDS-PAGE analysis and Coomassie staining as described above to find out which fractions contain Shadoo. Note: Desalting procedure removes salts, imidazole and urea to obtain recombinant Shadoo protein in a buffer suitable for further biophysical and biochemical studies (Figure 3C). The same result can be obtained by dialyzing samples against the buffer. Equilibrate a desalting column of 53 ml with 150 ml of 10 mM ammonium acetate buffer, pH 5, at flow rate of 5 ml/min. Load pooled Shadoo fractions on the column. Upon injection of the ammonium acetate buffer collect manually fractions that show an increase of the signal at 280 nm at the output of the UV detector. Freeze-dry the desalted Shadoo and store it at -20 °C. Dissolve lyophilized Shadoo in an adequate buffer, such as 10 mM sodium acetate buffer, pH 5, prior to use. Note: The polyhistidine tag can be removed with enterokinase. Note: The Shadoo protein aggregates and spontaneously forms fibrils at pH ≥ 7 11. Figure 4. Scheme of Shadoo refolding to amyloid fibrils (as described in step 3). Purified Shadoo spontaneously converts to amyloid fibrils when dissolved in buffer of pH ≥ 7. In an acidic solution, Shadoo converts to amyloid fibrils upon incubation with 1 M Gdn-HCl while shaking. Quality control assays include electronic microscopy and ThT staining. Please click here to view a larger version of this figure. Dilute Shadoo to a final concentration of 2 µM in a 20 mM Tris-HCl buffer, pH 7.4. Measure the concentration by measuring the optical density of the solution at 280 nm and using the extinction coefficient deduced from Shadoo amino acid composition of 20,970. 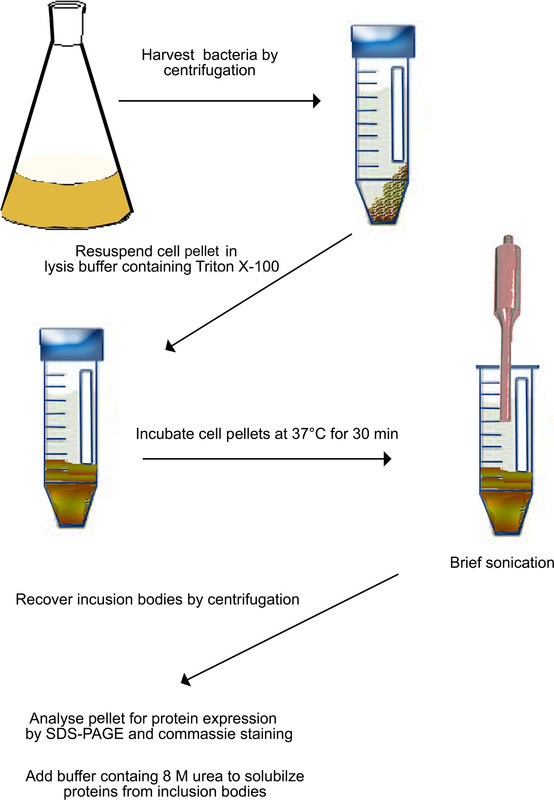 Incubate 500 µl of the solution in a conical plastic tube at 4 °C for a couple of weeks, to allow spontaneous protein conversion to amyloid structures (Figure 4). Add freshly prepared thioflavin T (ThT) to a final concentration of 10 µM to a 100 µl aliquot of the Shadoo solution. Incubate the solution for 5 min at RT. Measure fluorescence emission from 460 to 520 nm using an excitation wavelength of 435 nm to verify the presence of amyloid structures 17. Dilute Shadoo in 1 M GdnHCl, 20 mM Na-acetate buffer, pH 5 to a final concentration of 2 µM. Incubate 500 µl of this solution in a conical tube with continuous shaking at 37 °C, for 3-7 days. Check the presence of amyloid fibrils by adding ThT to an aliquot of the solution as in 3.3. Dialyze obtained suspension against 10 mM Na-acetate buffer, pH 5.0, to purify Shadoo amyloid fibrils. Store purified fibrils at +4 °C. Figure 5. Representative results. 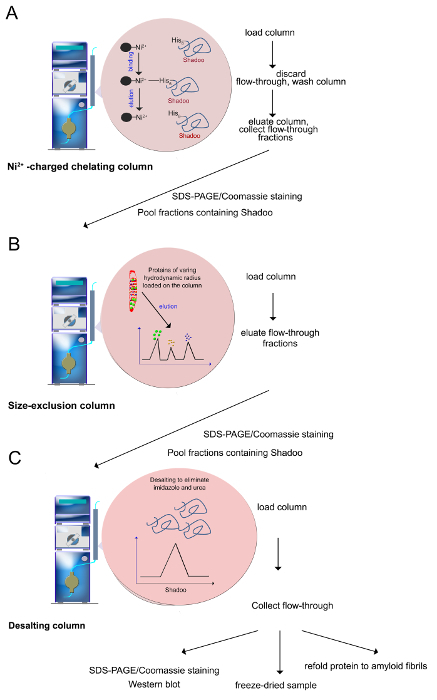 Protein fractions eluted from Ni2+-charged chelating column (A) and size exclusion column (B) were analyzed using SDS-PAGE and Coomassie staining. Identification of purified Shadoo was assessed using SPRN anti-Shadoo antibody (C). Please click here to view a larger version of this figure. About 5-10 mg of purified Shadoo protein is obtained per liter of bacterial culture. A two-step purification is needed to obtain recombinant Shadoo of high purity. The first step is performed by affinity chromatography with a Ni2+-charged column that retains His-tagged-proteins. Eluted fractions are subjected to SDS-PAGE and stained with Coomassie Brilliant Blue (Figure 5A). Fractions containing Shadoo protein are pooled and further purified by size-exclusion chromatography which separates proteins according to their size (Shadoo molecular weight is about 12 kDa). 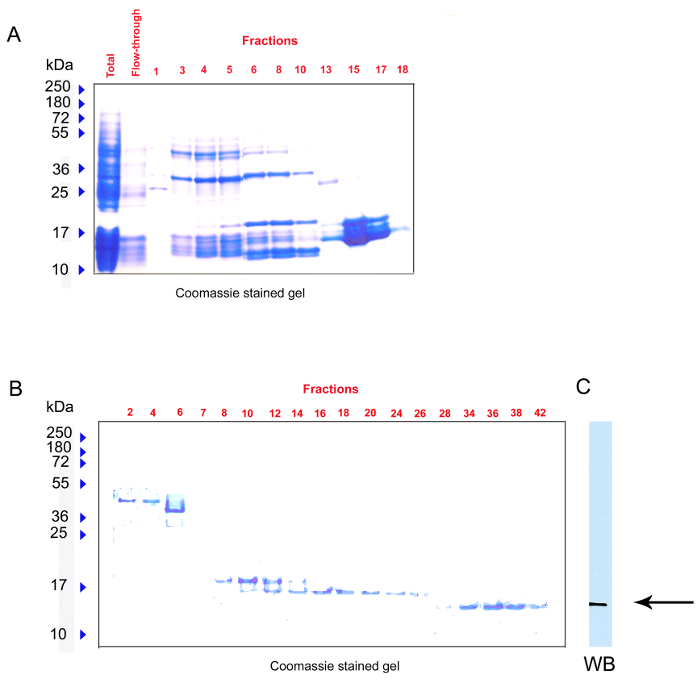 Fractions collected upon elution are visualized by SDS-PAGE/Coomassie analysis (Figure 5B). In addition, Shadoo is evidenced by Western-blot using a specific anti-Shadoo antibody, SPRN that binds to a sensitive epitope between 76-105 amino acids from the protein C-terminal region (Figure 5C). Shadoo refolding to amyloid fibrils is verified by ThT staining (Figure 6A) and by negative staining electron microscopy (Figure 6B). ThT is a fluorescent dye which binds cross-β-sheet quaternary structures characteristic for amyloid assemblies. Increase in the ThT intensity in Figure 6A indicates that Shadoo is converted to amyloidal structures. Figure 6. Representative results. (A) Shadoo fibrils of 2 µM monomer equivalent concentration were preincubated with ThT (10 µM final concentration) for 5 min at RT. Fluorescent emission intensities are recorded for each sample using an excitation wavelength at 435 nm. Note a significant increase in ThT fluorescence intensity in a solution containing Shadoo polymerized to amyloid fibrils compared to the control solution of monomeric Shadoo. (B) Transmission electron microscopy of fibrillated Shadoo. Please click here to view a larger version of this figure. An easy and efficient protocol for both expression and purification of a large amount of recombinant mouse Shadoo protein is presented. The method described allows successful solubilization and purification of (His6)-tagged recombinant Shadoo protein. It is important, as pointed out in the title, that when expressed in a prokaryotic bacterium E. coli Shadoo accumulates in inclusion bodies. Prior to Shadoo purification, bacteria have to be lysed by sonication in a buffer containing Triton X-100. Subsequently inclusion bodies can be solubilized in 8 M urea denaturing solution. Further, the whole purification procedure has to be performed in 8 M urea buffer solution since Shadoo tends to polymerize and aggregate. After solubilization and clarification of inclusion bodies, the supernatant containing denatured proteins is subjected to two-step purification procedure: affinity chromatography and size-exclusion chromatography. The affinity chromatography step consists in binding Shadoo via the (His6)-tag to a Ni2+-charged chelating column. In 8 M urea solution proteins are denatured and their histidine residues are surface-exposed. In addition, urea promotes Shadoo structural integrity by preventing proteolysis in the event of contaminating proteases. In the second purification step, Shadoo eluted from with the gradient of imidazole is subjected to size-exclusion chromatography in order to separate contaminant proteins. During the second step, large proteins are eluted first, as they are unable to enter the pores of the matrix and, thus, have a direct path through the column. Smaller proteins, as Shadoo, take longer to elute from the column since they can enter the pores and have a more convoluted path. Finally, the protein preparation is desalted to remove urea, imidazole and salts. Quality control indicates that following this procedure recombinant Shadoo is purified to high purity. It can be utilized in various biological and biotechnological studies. The E. coli expression system is an extremely useful tool for expression of recombinant proteins. The low cost, easy manipulation, rapidity and convenience of expressing mammalian proteins in E. coli make of this host the first choice tool for life science applications. However, not all mammalian proteins can be expressed in soluble form or/and in a sufficient amount in this bacteria. Sometimes, obstacles may be overcome by different strategies as lowering expression temperature, changing promoters, adding purification tags, using alternative media 18-20. However, in some cases, finding an optimal expression condition may have a high cost in time and efforts. Difficulties to produce recombinant Shadoo were overcome with the SoluBL21 competent E. coli strain. This mutant host strain significantly improved the yield of Shadoo production and allowed us to obtain fully soluble Shadoo. Yields obtained were in the range 5-10 mg/L culture. Recombinant Shadoo was shown to be a natively unstructured protein giving a random-coil feature by circular dichroism spectroscopy 11,12. Being a highly positively charged protein (pI ~ 10.44) Shadoo tends to aggregate at the physiological pH. However, Shadoo is fully soluble in buffer solutions of acidic pHs. We presented here simple and efficient protocols to polymerize Shadoo to amyloid fibrils at various pHs. Polymerized Shadoo represents a valuable tool to study pathological protein foldings that characterize some neurodegenerative diseases. The recombinant Shadoo purified using our procedure can be used for further biochemical and structural characterizations of the conformational transition process. Based on its primary structure, Shadoo was predicted to have one N-linked glycosylation site and signal peptides for attachment of the glycosylphosphatidylinositol (GPI) anchor next to its C-terminus (Figure 1A). 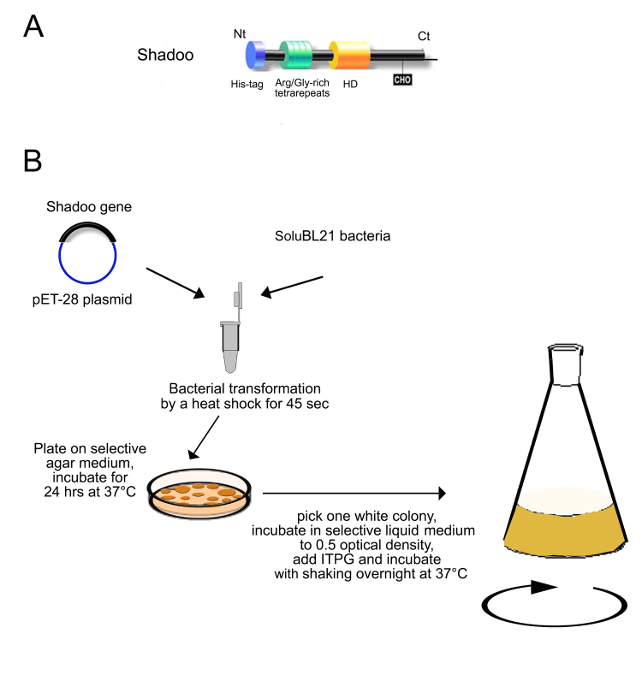 Recombinant Shadoo purified from inclusion bodies is deprived of carbohydrates since E.coli expression system is not able to perform post-translational modifications. In consequence, interactions of recombinant Shadoo with proteins, lipids or nucleic acids may be modified compared to the native protein. For instance, the importance of Shadoo glycosylation was recently proposed for Shadoo proteasome degradation after protein modification by ubiquitination 21. The role of GPI anchor in prion disease is not well known, but many studies suggest that GPI anchor may play a role in the pathogenesis of prion diseases 22,23. Thus, bacterial expressed Shadoo can be used for in vitro studies taking into account these limitations. The authors would like to acknowledge Natalie Doude and David Westerway (University of Alberta) for providing us Sho cDNA, Christophe Chevalier (INRA) for plasmid construction, Michel Brémont (INRA) for providing us BL21Sol bacteria; Christine Longin (INRA) for TEM assistance and Edith Pajot-Augy (INRA) for comments and proofreading. Biasini, E., Turnbaugh, J. A., Unterberger, U., Harris, D. A. Prion protein at the crossroads of physiology and disease. Trends in Neurosciences. 35, 92-103 (2012). Colby, D. W., Prusiner, S. B. De novo generation of prion strains. Nature Reviews. Microbiology. 9, 771-777 (2011). Chiti, F., Dobson, C. M. Protein misfolding, functional amyloid, and human disease. Annual Review of Biochemistry. 75, 333-366 (2006). Nelson, R., et al. Structure of the cross-beta spine of amyloid-like fibrils. Nature. 435, 773-778 (2005). Murphy, R. M. Kinetics of amyloid formation and membrane interaction with amyloidogenic proteins. Biochimica et Biophysica Acta. 1768, 1923-1934 (2007). Steunou, S., Chich, J. F., Rezaei, H., Vidic, J. Biosensing of lipid-prion interactions: insights on charge effect, Cu(II)-ions binding and prion oligomerization. Biosensors & Bioelectronics. 26, 1399-1406 (2010). Watts, J. C., Westaway, D. The prion protein family: diversity, rivalry, and dysfunction. Biochimica et Biophysica Acta. 1772, 654-672 (2007). Westaway, D., Daude, N., Wohlgemuth, S., Harrison, P. The PrP-like proteins Shadoo and Doppel. Topics in Current Chemistry. 305, 225-256 (2011). Baillod, P., Garrec, J., Tavernelli, I., Rothlisberger, U. Prion versus doppel protein misfolding: new insights from replica-exchange molecular dynamics simulations. Biochemistry. 52, 8518-8526 (2013). Daude, N., et al. 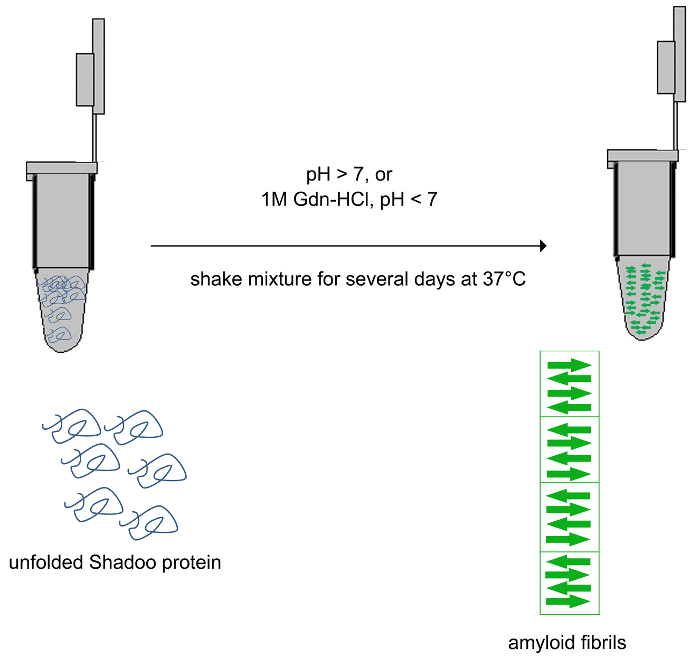 Wild-type Shadoo proteins convert to amyloid-like forms under native conditions. Journal of Neurochemistry. 113, 92-104 (2010). Li, Q., et al. Shadoo binds lipid membranes and undergoes aggregation and fibrillization. Biochemical and Biophysical Research Communications. 438, 519-525 (2013). Watts, J. C., et al. The CNS glycoprotein Shadoo has PrP(C)-like protective properties and displays reduced levels in prion infections. The EMBO Journal. 26, 4038-4050 (2007). Watts, J. C., et al. Protease-resistant prions selectively decrease Shadoo protein. PLoS Pathogens. 7, e1002382 (2011). Westaway, D., et al. Down-regulation of Shadoo in prion infections traces a pre-clinical event inversely related to PrP(Sc) accumulation. PLoS Pathogens. 7, e1002391 (2011). Chevalier, C., et al. PB1-F2 influenza A virus protein adopts a beta-sheet conformation and forms amyloid fibers in membrane environments. The Journal of Biological Chemistry. 285, 13233-13243 (2010). Tarus, B., et al. Oligomerization paths of the nucleoprotein of influenza A virus. Biochimie. 94, 776-785 (2012). Biancalana, M., Koide, S. Molecular mechanism of Thioflavin-T binding to amyloid fibrils. Biochimica et Biophysica Acta. 1804, 1405-1412 (2010). Minic, J., Sautel, M., Salesse, R., Pajot-Augy, E. Yeast system as a screening tool for pharmacological assessment of g protein coupled receptors. Current Medicinal Chemistry. 12, 961-969 (2005). Schein, C. H. A cool way to make proteins. Nature Biotechnology. 22, 826-827 (2004). Sorensen, H. P., Mortensen, K. K. Advanced genetic strategies for recombinant protein expression in Escherichia coli. Journal of Biotechnology. 115, 113-128 (2005). Zhang, J., et al. Disruption of glycosylation enhances ubiquitin-mediated proteasomal degradation of Shadoo in Scrapie-infected rodents and cultured cells. Molecular Neurobiology. 49, 1373-1384 (2014). Englund, P. T. The structure and biosynthesis of glycosyl phosphatidylinositol protein anchors. Annual Review of Biochemistry. 62, 121-138 (1993). Puig, B., Altmeppen, H., Glatzel, M. The GPI-anchoring of PrP: implications in sorting and pathogenesis. Prion. 8, 11-18 (2014).